The ultimate Thanksgiving destination – Abu Dhabi! Let’s just say you have a week to kill and you decide to fly to Abu Dhabi to spend it with people you barely know. It’s your wife’s friend and her husband. You’ve had dinner all together exactly once. What could possibly go wrong? Through nobody’s fault at all, we had a hole in our schedule. It’s a relatively short flight from Istanbul and we were hoping they’d say yes. Kathy graciously accepted Janine’s proposal, but let us know that she and Brian would be leaving mid-week for a vacation to Sri Lanka. Even so, they encouraged us to stay at the apartment after they left, which worked out well for us and allowed us the opportunity to take care of Rupert P. Kleiver, their loveable, five year old Black Mouth Cur. Think about it. Janine and Kathy met at a conference and stayed in touch, but that was about it. They have really only seen each other a couple of times. We all had dinner together in New York once, but I doubt Brian or I could have picked each other out in a lineup of one guy. And now we were signed up for a week of close contact and we were also on the hook to make sure that their beloved dog didn’t run away or wreck the place or bite some kid. As I look back, if you will pardon my French, this had the makings of a real shitshow. And let this be a lesson to you people. Every so often a truly bad idea has a happy ending. This could have been the week from hell, but as it turned out we had a terrific time. There were many boy-boy/girl-girl Men are like Mars, Women are Like Venus moments. While the four of us are all fabulously modern with regard to gender roles and such, it is also true that the boys played golf and the girls had their toes done. Thanksgiving was brilliant. Kathy made a stunning sweet potato and apple soup, and Brian made a turkey roulade, mashed potatoes, roasted Brussels sprouts with pancetta, stuffing (on top of which he roasted a turkey leg and thigh – I must try that someday), a pecan pie, and a pumpkin pie. I made an apple pie (although Brian had already made the crust, which was excellent). 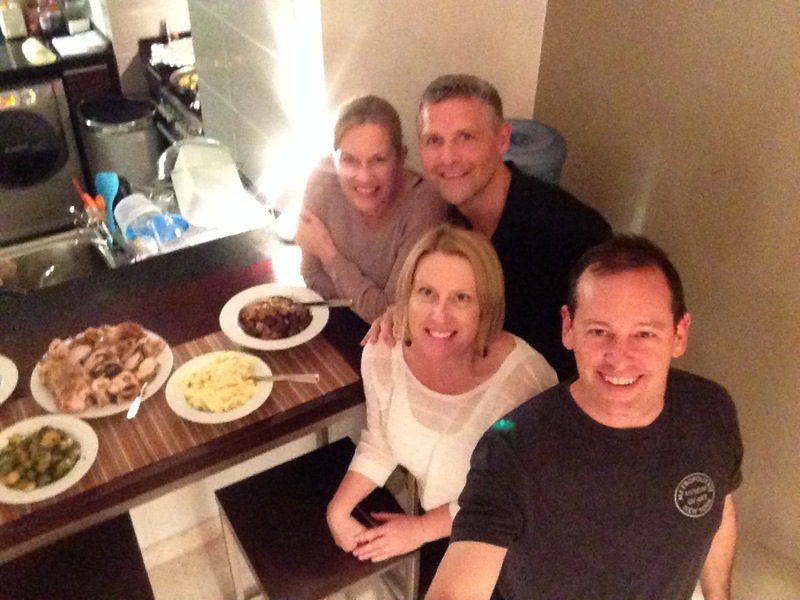 When I woke up on New Year’s Day 2014, I would scarcely have imagined that I’d be having Thanksgiving dinner in the United Arab Emirates with people I barely know, but that’s life for you, isn’t it? I didn’t have much of a mental picture of Abu Dhabi. I know that its next door neighbor Dubai is famous for its tall buildings and Vegas-y vibe, with a Middle East twist, but I had no sense of what Abu Dhabi would be like. Abu Dhabi is much different. 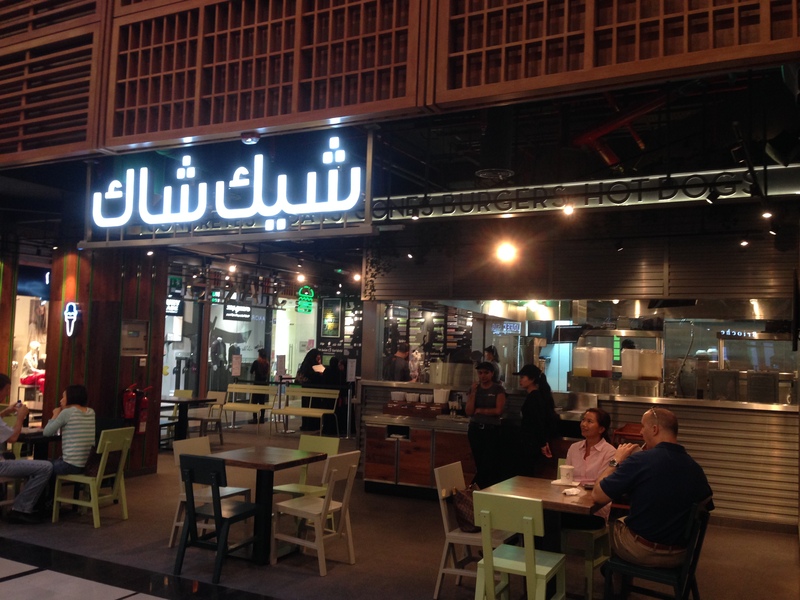 It has tall buildings and a Miami vibe with a Middle East twist. Sometimes it seems that there are more cranes than people. The weather is lovely this time of year, topping out in the low 80s. (Don’t come in summer, when it gets up to 130. No, that’s not a typo). After flatlining during the downturn, there are once again cranes everywhere. It’s a city of outsiders – only about a third of the population are from the Arabian peninsula. But it is nevertheless a very Arabian Muslim city. Many women are fully covered and wherever you look you see men in the familiar white robe called a thawb. The call to prayer emits from speakers around the city five times a day. The workweek is Sunday through Thursday. 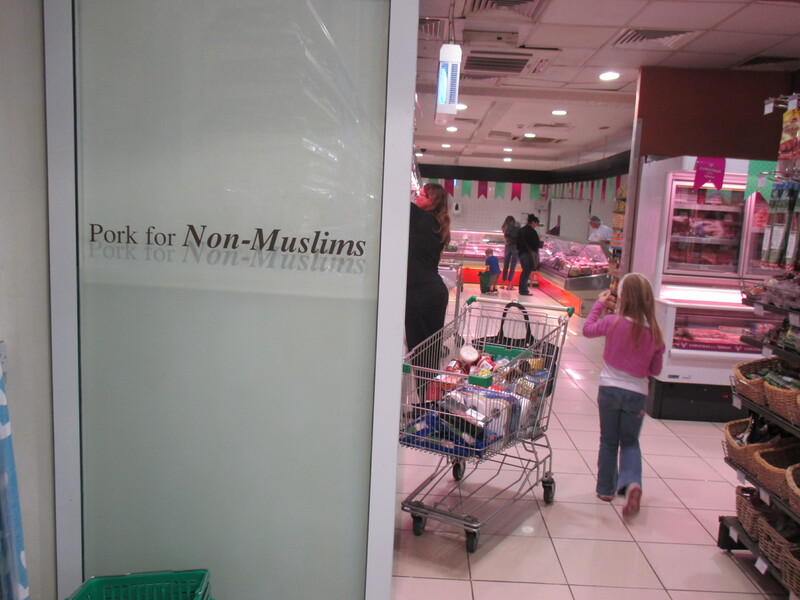 In the UAE you have to go to a separate store to buy alcohol (Wait! That’s also true in New York and Maryland.) and it’s only served in hotels. Certain supermarkets sell pork, but to get to the pork products, you have to enter the “pork room,” which brings to mind the curtained-off section of the video store (remember them?) that had the dirty movies. Behind this door is a world of pork. At the same time, the supermarkets are chockablock with familiar foods, from taco shells to Hellman’s mayonnaise. The malls (and there are tons of them) have just about every western product you can think of, including a Shake Shack (or, if you will, Sheik Shack, har har). You can live here indefinitely without having to learn a word of Arabic. There is no shortage of national pride here. Our visit coincided with National Day, which celebrates the unification of seven emirates (including Dubai, Abu Dhabi, and five others that I hadn’t heard of) into one administrative body independent of the British, who ran the place until 1971. 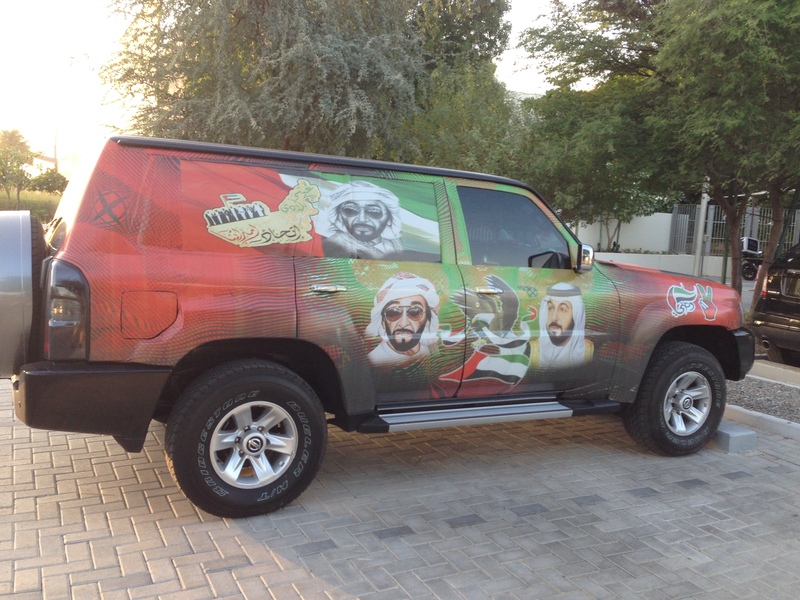 The UAE flag was everywhere, and people have taken to draping their cars with those vinyl wrappers that you normally see on buses and trains. Most incorporate the suave if slightly grumpy visage of the UAE’s George Washington, Sheikh Zayed bin Sultan Al Nahyan, who was the federation’s first president. The UAE’s version of the Blue Angels flew overhead, streaming the national colors in their contrails. We watched a fireworks display that would have impressed the Grucci brothers. It was Thanksgiving and Fourth of July rolled into one. We did not do a ton of sightseeing, but what we saw was impressive. The Grand Mosque, which was completed in 2007, is the eighth largest mosque in the world. It took eleven years to complete, and it’s full of notable features. The Persian carpet is more than 1.3 acres and has more than 2 billion knots. Its largest chandelier (there are seven) is the third largest in the world. The list goes on. In short, this is a big, brash mosque. 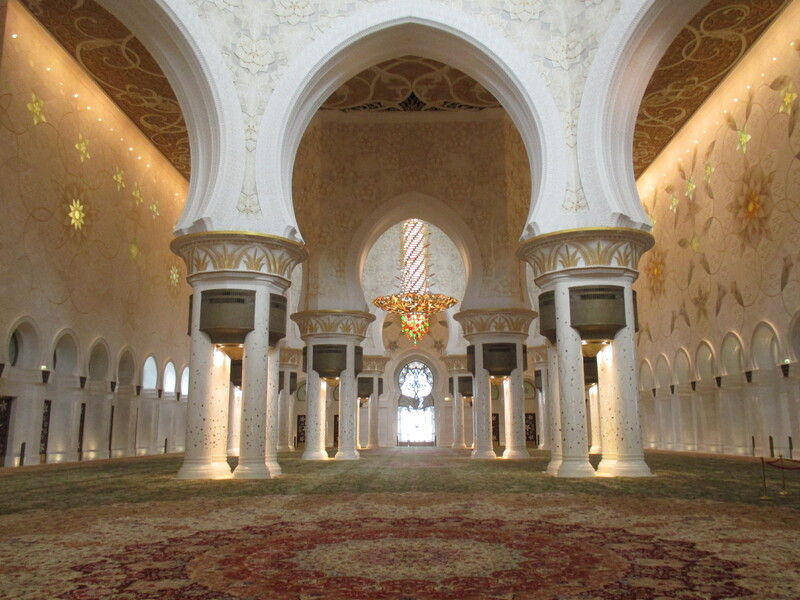 We also toured the Grand Mosque’s secular counterpart – the Emirates Palace Hotel. This is the building that oil built, like much the rest of the great structures of Dubai and Abu Dhabi. Where the region once produced fish and pearls (and sand), by an accident of prehistoric happenstance, this place is now fabulously wealthy. The decision to make the UAE a tourist and shopping destination represents a realization that the wells will someday run dry. For the world’s rich and famous, the Emirates Palace is as good a place as any to efficiently relieve yourself of excess capital. The three room sultan’s suites (there are a bunch of them) are more than seven thousand square feet, they rent for about $16,000 a night, and they are regularly occupied. In the lobby, you can have a cappuccino topped with gold leaf (I opted for the humble camel’s milk version) and there is a vending machine that dispenses gold necklaces. 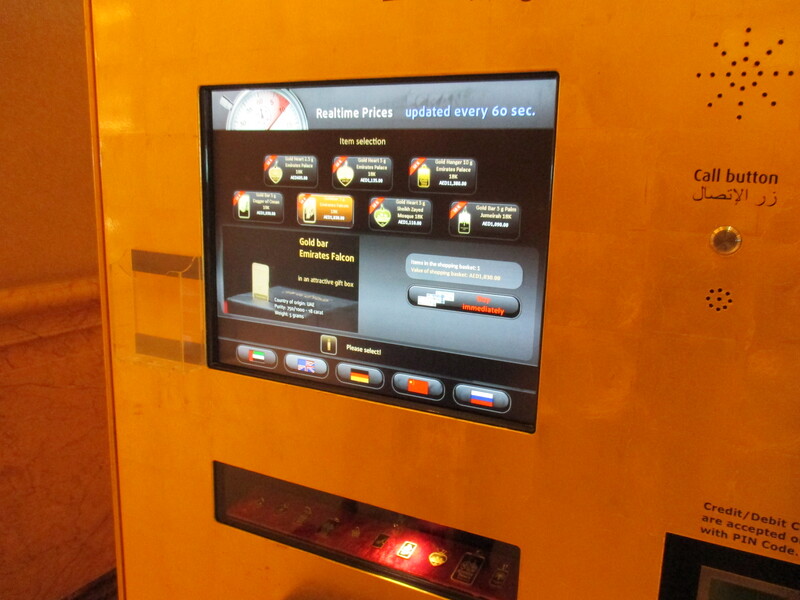 Yep, a gold vending machine. 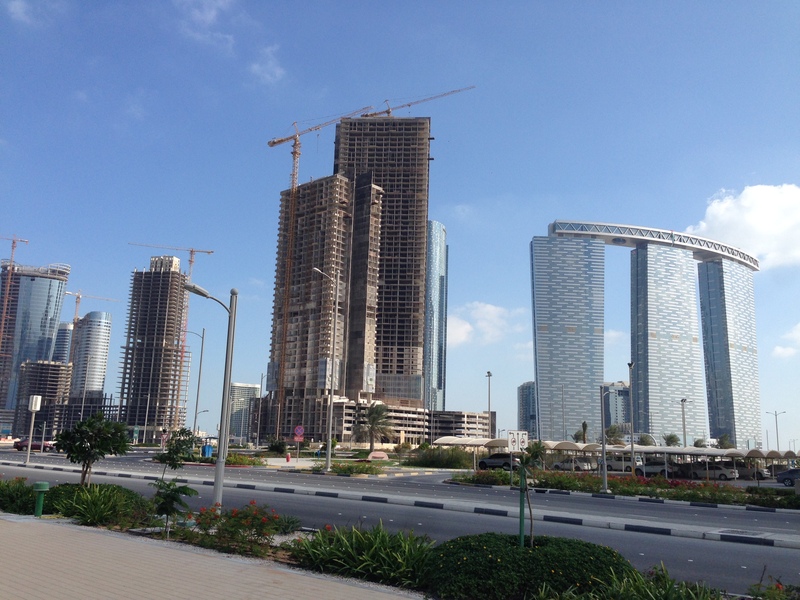 Abu Dhabi and Dubai may seem gaudy and excessive, but who are we Americans to judge? After all, Business Week says that Americans spend over forty billion dollars a year on weight loss products. I won’t be making a habit of gold leaf cappuccinos, but this place is similar enough to our own part of the world to be familiar but different enough to set your cultural gyroscope spinning just out of control enough to make you pretty dizzy. I like places that do that. Speaking of spinning cultural gyroscopes, our next stop is Cairo. ← What do you do when you’re just not feeling it?